Variola virus species cause two acute infectious diseases believed to have emerged in human population around 10000 BC. Variola major causes smallpox and Variola minor causes alastrim. The organism got its name from the Latin word varius meaning spotted, or varus meaning “pimple”. During the 20th century alone it is estimated that 200 to 300 million people died due to smallpox. After a successful vaccination campaign throughout 19th and 20th century around the globe caused the virus to be eradicated from the nature completely by 1979. At present, smallpox is the only human disease that has been completely eradicated from nature, although eradication may be close for several other diseases. 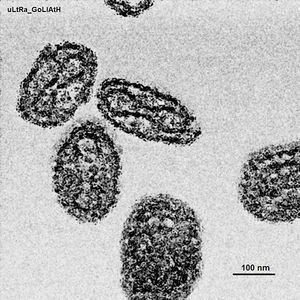 Smallpox is contagious from human to human, which was usually considered undesirable for a military biological weapon, because an attack might go out of control and affect one's own troops. While only two cultures are known to exist in the world, there are concerns that some other cultures may exist. Its properties of contagion are attractive to groups not intending traditional military objectives, but bioterrorism. The appearance of even one clinical case of smallpox would be presumptive evidence of a terrorist attack, and plans in place would treat it as a global public health crisis. Not only is it listed in the Select Agent Program, and recognized in the highest-risk category of potential biological weapons, its study is restricted to two laboratories, with precautions above standard Biological Safety Level 4 (BSL-4). It is in CDC Bioterrorism Agents-Disease list Category A.
Variola virus is a large brick shaped virus with a measurement of 302 to 350 nm by 244 to 277 nm, which consist of single linear double stranded DNA. It genome consist of 186 kbp and contain a hairpin loop at each end. The hairpin loop at each end consists of 530 bp fragments. The entire genome consists of 186,102 base pairs. They have 187 closely spaced open reading frames specifying putative major proteins contain more that or equal to 65 amino acids. They contain 69-bp direct repeat elements, a 54-bp partial repeat element, and a 105-base telomeric end-loop that can be maximally base-paired to contain 17 mismatches. Variola viruses are DNA viruses, which are unique because they replicate in cytoplasm instead of nucleus like other DNA viruses. Virions consist of an envelope, a surface membrane, a core, and lateral bodies, or a surface membrane, a core, and lateral bodies. During their life cycles variola produces extracellular and intracellular particles. The infection is caused by the extracellular particles. The capsid of virus is enveloped and virons mature naturally by budding through the membrane of the host cell. They produce variety of specialized protein for replications, which are not produced by other DNA viruses. The most important of this protein are DNA-dependent RNA polymerase. There are two kinds of these viruses, which are enveloped and non-enveloped which both causes diseases. The viral envelope is made from modified trans Golgi membranes and also contains a specific protein called hemagglutinin. Variola viruses attacks primarily human host but there are also other close relatives like vaccinia, cowpox, and monkey pox which could infect both humans and other animals. This organism is transmitted among humans primarily by inhalation of virus or by droplets from oral, nasal or pharyngeal mucus of an infected person. The virus usually enter in the human body through respiratory tract, grows on the mucous membrane and then spreads to the lymph nodes where it multiplies and then finally enters the blood stream. After entering the blood stream the virus invades internal organs and skin. The time frame for the incubation of small pox is 10 to 12 days. The symptoms of smallpox include high fever, bad headaches, tiredness and rashes. First couple of day’s symptoms starts to appear like high fever, small rashes on face and other body parts. The small rashes become papules with a diameter of 2 to 3 mm over next couple of days gradually covering all over the body. Then the papules break and forms scabs, which begins to separate after the second week of the eruption. The death usually happens as a result of hemorrhage and toxemia or other secondary infections like pneumonia etc. In 1980, WHO declared naturally occurring small pox disease to be completely eradicated from the face of the world and this caused most of the research on variola virus to come to an abrupt end. Currently variola virus is officially retained at two locations in the world one being at CDC, Atlanta and other one being at the State Research Center of Virology and Biotechnology in Novosibirsk, Russia. Due to these reasons there are not that much research currently going on Variola virus and most of the research going on is to find a better vaccination in case of a bioterrorism attack. Currently a project is going on at CDC to sequence the genome of two isolates of variola called Congo 70 and Somalia 77, which are pathogens with bioterrorism potential. This page was last modified 16:59, 16 August 2008.